This picture book features rhyming text that details the hatching and first day of a baby bird. The ink/watercolor/pencil illustrations steal the show as the young bird discovers running, singing, and eating, among other things. The book ends with another hatching and the baby bird says hello to a sister. The rhyming text and large scale illustrations makes this book perfect for sharing with a group. Joining the ranks of other great odd pets picture books, How to Wash a Woolly Mammoth is a hilarious step-by-step bathtime story that preschool children will love! While this book would work well for storytime, I would also encourage parents to check it out after storytime so that they and their little ones can pour over the illustrations. There are some details in the pictures that they may not have noticed in a storytime crowd, but would love to laugh over together in a one on one reading session. One of my favorite things about this book in particular is the mammoth’s facial expressions. Colors abound in this short picture book in which the audience is in charge of a group of rowdy monsters. If a monster is noisy, children can tell him to be quiet. If a monster is selfish, children can tell him to take turns. Storytime crowds will love the chance to tell monsters to “sit still” and “go to sleep” and parents will appreciate that this book introduces a fun way to talk to their kids about manners and other social situations (including bullying). What I love best about this book, is what usually grabs my attention when it comes to picture books: bold, bright, and fun illustrations! 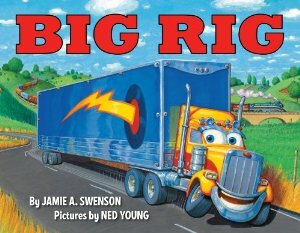 While there are a lot of things to love about this picture book about an 18-wheeler big rig, two things that really stand out for me include: the terminology and the sound effects. This book introduces young children to the work, mechanics, and terminology of trucking. The word ‘cargo’ is explained in the text, and the other terms are defined in a glossary at the back of the book. While adults will love the fact that this book helps expand a child’s vocabulary, children will love sounding the horn along with the truck throughout the story. I can already see myself going “URRRNNT-URRRNNNT!” in storytime now! Wonderful photoshop illustrations chronicle a year in the life of two birds. 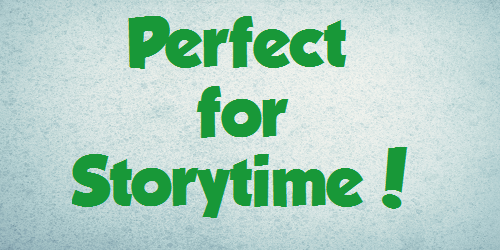 With one word per page, this book would be perfect for baby or toddler storytimes, though it could also work well with a slightly older group under the right circumstances. While not nonfiction, this book could still be used as a way to introduce habitats. My favorite thing about this book is how the seasons change in the illustrations. This book would be perfect for a birds, homes, forest, or seasons storytime. Reminiscent of Murphy’s “A Kiss Like This,” this picture book is bright, colorful, and has ample opportunity for little ones to make animal sounds. These are fabulous! I’ll be pinning all of your recommendations to Jbrary’s Pinterest boards. Thank you for this great list! I do lots of programming, but no ordering, so I passed these titles on to our ordering librarian. They look fun!